Natural Australian Doublet Opal, 0.26 ct. Every Opal piece is Unique. You won't find two exactly identical opal gems because of their unrepeatable play-of-color. Being worn frequently can help opal to acquire the necessary humidity from the air as well as from the skin. Free Gift Bag/Box with every order! Natural Australian Doublet Black Opal, Oval Shaped. Every Opal piece is Unique. You won't find two exactly identical opal gems because of their unrepeatable play-of-color. Australian Doublet Opal: 2.16 ct. Every Opal piece is Unique. You won't find two exactly identical opal gems because of their unrepeatable play-of-color. Being worn frequently can help opal to acquire the necessary humidity from the air as well as from the skin. Natural Australian Doublet Black Opal, 0.58 ct. Every Opal piece is Unique. You won't find two exactly identical opal gems because of their unrepeatable play-of-color. Being worn frequently can help opal to acquire the necessary humidity from the air as well as from the skin. Dainty Stackable Opal Earrings with Beautiful Colors. Free Gift Bag/Box with every order! Natural Australian Doublet Opal, 0.22 ct. Every Opal piece is Unique. You won't find two exactly identical opal gems because of their unrepeatable play-of-color. 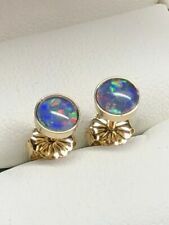 Yellow gold 14k studs opal doublet round 5mm direct from bench jewelry Made in usa . Free Gift Bag/Box with every order! Natural Australian Doublet Black Opal, Pear Shaped. Every Opal piece is Unique. You won't find two exactly identical opal gems because of their unrepeatable play-of-color. 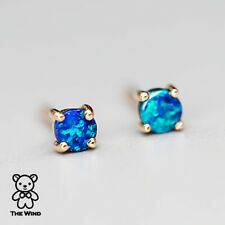 NATURAL BLUE DOUBLET OPAL AUSTRALIAN 925 STERLING SILVER STUD EARRINGS M55166. Primary Stone: DOUBLET OPAL AUSTRALIAN. Design: STUD. Style: Earrings. Fine handcrafted jewelry personally designed from the inspiration from those little things around us. Natural Australian Doublet Opal, 0.53 ct. Every Opal piece is Unique. You won't find two exactly identical opal gems because of their unrepeatable play-of-color. Being worn frequently can help opal to acquire the necessary humidity from the air as well as from the skin. 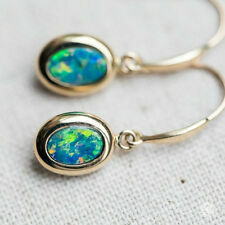 These exquisite earrings are handmade and showcase two natural opal gemstones. 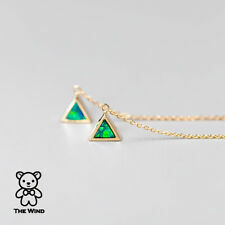 Two bezel set Opal gemstones. Style: Stud. Earrings Length: One is approx. 11mm and the other is approx 12mm. Gemstone color: Blue, Play of Color. Free Gift Bag/Box with every order! Natural Australian Doublet Black Opal, Round Shaped. Every Opal piece is Unique. You won't find two exactly identical opal gems because of their unrepeatable play-of-color. Free Gift Bag/Box with every order! Natural Australian Doublet Black Opal. Every Opal piece is Unique. You won't find two exactly identical opal gems because of their unrepeatable play-of-color. Being worn frequently can help opal to acquire the necessary humidity from the air as well as from the skin. Free Gift Bag/Box with every order! Natural Australian Doublet Black Opal: 0.38 ct. Every Opal piece is Unique. You won't find two exactly identical opal gems because of their unrepeatable play-of-color. Natural Australian Doublet Black Opal, 1.40 ct. Every Opal piece is Unique. You won't find two exactly identical opal gems because of their unrepeatable play-of-color. Being worn frequently can help opal to acquire the necessary humidity from the air as well as from the skin. Free Gift Bag/Box with every order! Natural Australian Doublet Opal, 0.49 ct. Every Opal piece is Unique. You won't find two exactly identical opal gems because of their unrepeatable play-of-color. Simple and Small Pear Shaped Natural Australian Doublet Black Opal Stud Earrings in 925 Sterling Silver. Free Gift Bag with every order! Natural Australian Doublet Black Opal, Pear Shaped. Every Opal piece is Unique. 14k Yellow Gold Stud Earrings with Oval Shaped Natural Australian Doublet Black Opal, Gold Opal Stud Earrings. Free Gift Bag/Box with every order! Natural Australian Doublet Black Opal, Oval Shaped. Free Gift Bag/Box with every order! Natural Australian Doublet Black Opal, 0.252 ct. Every Opal piece is Unique. You won't find two exactly identical opal gems because of their unrepeatable play-of-color. Natural Australian Doublet Opal, 0.41 ct. Every Opal piece is Unique. You won't find two exactly identical opal gems because of their unrepeatable play-of-color. Being worn frequently can help opal to acquire the necessary humidity from the air as well as from the skin. Rainbow Color Pear Shaped Australian Doublet Black Opal Stud Earrings 14K Gold, Gold Opal Stud Earrings. Free Gift Bag/Box with every order! Natural Australian Doublet Black Opal, 0.557 ct. Every Opal piece is Unique. 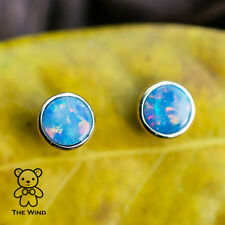 Natural Australian Doublet Black Opal Stud Earrings in Solid 925 Sterling Silver. Free Gift Bag with every order! Natural Australian Doublet Black Opal, Oval Shaped, 0.87 ct. 36 Zircon: 0.82 ct. Every Opal piece is Unique. Indian Ethnic Necklace. Fusion Gold Earrings. Turquoise Diamond Jewelry. Sapphire Jewelry. Designer Gemstone Earrings. Victorian Earrings. Pave Diamond Jewelry. Natural Ruby Jewelry. Primary Stone: DOUBLET OPAL AUSTRALIAN. Design: STUD. Style: Earrings. Fine handcrafted jewelry personally designed from the inspiration from those little things around us. Color: BLUE. We too take and feel the delight to fabricate enticing Victorian style, traditional designs. Every Opal piece is Unique. You won't find two exactly identical opal gems because of their unrepeatable play-of-color. Being worn frequently can help opal to acquire the necessary humidity from the air as well as from the skin. Natural Australian Doublet Black Opal, Oval Shaped. Every Opal piece is Unique. You won't find two exactly identical opal gems because of their unrepeatable play-of-color. Being worn frequently can help opal to acquire the necessary humidity from the air as well as from the skin. Free Gift Bag/Box with every order! Natural Australian Doublet Black Opal: 0.51 ct. Every Opal piece is Unique. You won't find two exactly identical opal gems because of their unrepeatable play-of-color. Free Gift Bag/Box with every order! Natural Australian Doublet Black Opal: 0.24 ct. Every Opal piece is Unique. You won't find two exactly identical opal gems because of their unrepeatable play-of-color. Natural Australian Doublet Opal, 1.89 ct. Every Opal piece is Unique. You won't find two exactly identical opal gems because of their unrepeatable play-of-color. Being worn frequently can help opal to acquire the necessary humidity from the air as well as from the skin. (ref 3332). Parcel of 4 Beautiful Genuine Australian Opal Earrings. All our products are genuine opal as described. Gem Grade Doublet Opals. Solid Sterling Silver. Stud style earrings. Receive actual earrings in photo. Doublet Opal Gemstone Tiny Stud Earrings Solid 14k Yellow Gold Handmade Jewelry. Doublet Opal wt. 14K Yellow Gold : 1.00 gm (Approx). Diamonds Studs G old diamond Rings Gold Diamond pendant Diamond Necklace. Free Gift Bag/Box with every order! Natural Australian Doublet Black Opal: 1.38 ct. Every Opal piece is Unique. You won't find two exactly identical opal gems because of their unrepeatable play-of-color. Brilliant Opal & Diamond with 14k Gold Heart, Drop Earrings Doublet Australian Opal. Free Gift Bag/Box with every order! Natural Australian Doublet Black Opal, Square Shaped. Every Opal piece is Unique. Free Gift Bag/Box with every order! Natural Australian Doublet Black Opal: 0.33 ct. Every Opal piece is Unique. You won't find two exactly identical opal gems because of their unrepeatable play-of-color.